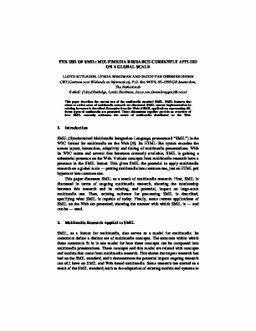 This paper describes the current use of the multimedia standard SMIL. SMIL features that relate to active areas of multimedia research are discussed. SMIL current implementation in existing browsers is described. Examples from the Web of SMIL applications representing different types of multimedia are presented. These discussions together provide an overview of how SMIL currently addresses the needs of multimedia distributed on the Web. Rutledge, L, Hardman, L, & van Ossenbruggen, J.R. (1999). The Use of SMIL: Multimedia Research Currently Applied on a Global Scale. In Proceedings of International Conference on Multimedia Modeling 1999 (MMM 0) (pp. 1–17). World Scientific.